If you have spent any time following this blog, you might have caught on to the fact that I am a huge fan of the humble taco. It's simple, unassuming, and is naturally gluten-free, if made with corn tortillas. In my travels, I have reviewed quite a few gluten-free friendly taco places that have impressed me. 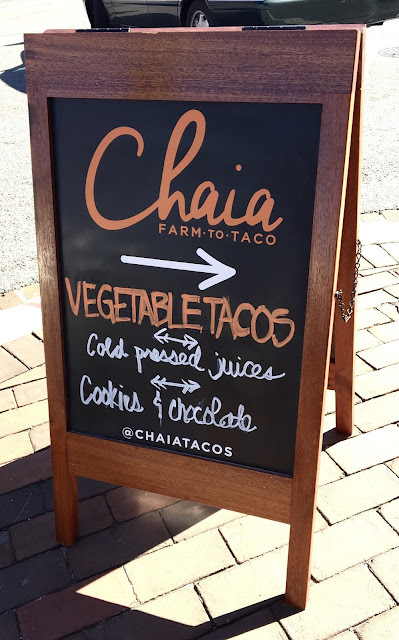 In discovering Chaia online, I was impressed by their farm-to-table focus and commitment to creating food that is not only good to eat, but is good for you. 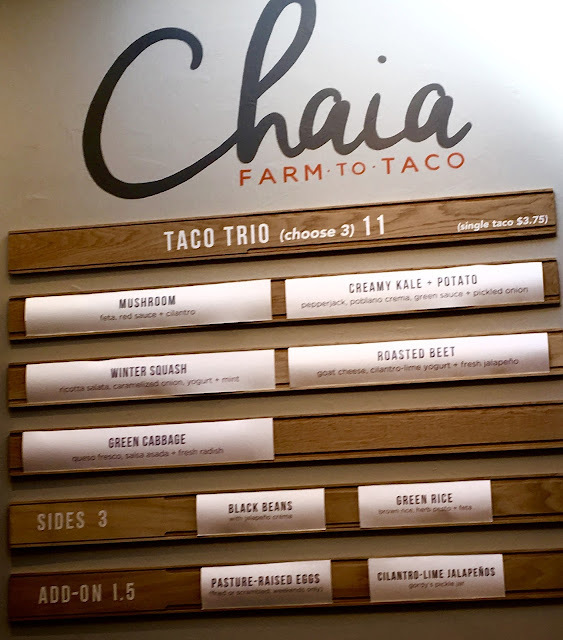 With an entirely gluten-free menu that's also entirely meatless, Chaia is a must for gluten-free foodies, vegans, and other "conscious eaters." Nestled in a side street in Georgetown, the picturesque restaurant is off the beaten path but worth your while to pay it a visit. What's really cool about Chaia is that it is a former staple at DC area farmers' markets. As their tacos warranted acclaim, the company moved from the streets to a brick and mortar location late last year. Though the menu may seem small, but it is intentionally crafted to feature the season's freshest flavors prepared to promote their health benefit. The entire menu is gluten-free and meat-free, and upon request everything can be made diary-free and/or vegan. Drinks available include teas, coffee, and juices as well as local wine. Baked goods and chocolate on hand are also gluten-free and vegan. I decided to order a taco duo of mushroom and green cabbage, prepared dairy-free. I love how the tortillas for the tacos are handmade in-house and that both are topped with micro greens for a finishing touch. Because the tacos were plant-based the two definitely filled me me up. The green cabbage one, had a wonderful cooked cabbage flavor, which is one of my favorite vegetables. Topped with radishes and red sauce, it was light, yet satisfying. The mushroom taco actually had a meatiness to it, which really contrasted well with the cabbage taco. The micro green garnish was noticeably fresh, and overall both tacos scored a big thumbs up from me. The tortillas were firm and flexible, not needing to be double wrapped to support the abundance of stuffings. Although the staff were not making tortillas while I was there, sometime you can watch them make the tortillas right in house. 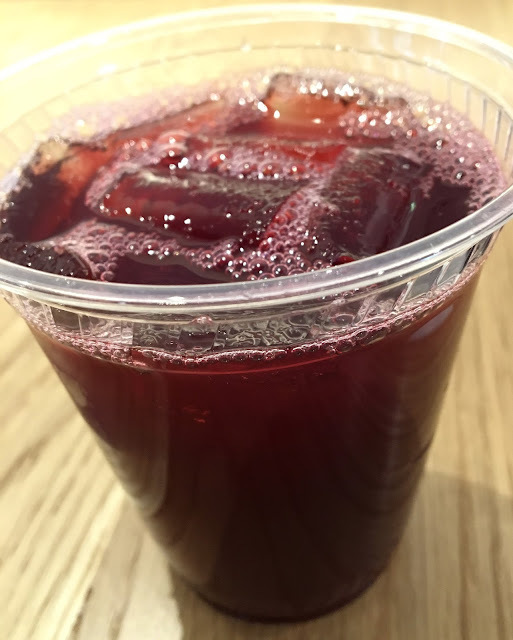 Although I rarely deviate from drinking water, I decided to order the iced hibiscus tea on tap, inspired by my love for Tamale Co.'s hibiscus aqua fresca. Sweetened with honey, this deep raspberry-colored drink was the perfect blend of fruity and sweet. What's so wonderful about Chaia is that it could easily be a pretentious, self-righteous concept as a vegetarian-focused restaurant. However, it's the polar opposite of that. The staff are warm, welcoming, and friendly and the food is down-to-earth, yet still dazzling. 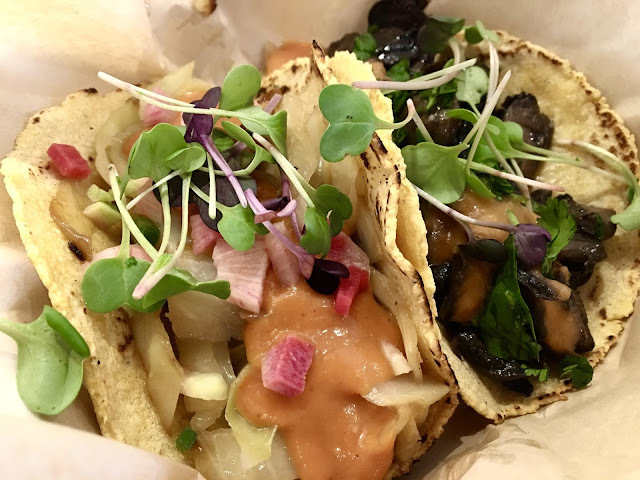 They really do bring farm-fresh ingredients to their tacos, and prove that conscious eating can be truly delicious. I unreservedly love Chaia. The food is out of this world and the atmosphere is really rejuvenating, with ample sunlight brightening up the restaurant. I left feeling refreshed and relaxed, and definitely will make a point of returning next time I am in the Georgetown area. Clean eating does not have to be unenjoyable, and Chaia proves this point beautifully. I'll even go as far as to crown it as my favorite restaurant in D.C. at the moment. Price: Three tacos for $11 or $3.75 each. The tea was $3. Special Feature: Rent Chaia's beautiful space for your next event. Find out more here.